Citizens in Space has acquired an initial contract for 10 suborbital spaceflights on the Lynx spacecraft, currently under development by XCOR Aerospace. We are inviting citizen scientists to submit payloads to fly on these flights. These experiments are intended to be pathfinders for many more experiments which will fly in the future. Professional researchers are welcome to submit experiments, too, if they play by our rules. We are advocates of citizen science and open collaboration. We will fly these pathfinder experiments free of charge, but any experiment submitted must be licensed as open-source hardware. These experiments will be operated in flight by a citizen astronaut chosen by Citizens in Space. We currently have three citizen astronaut candidates in training to fly as payload operators. We will be selecting seven more over the next 12 to 24 months. Citizen scientists who have built payloads for our flights will receive special consideration in the selection process. Along with the general call for experiments, we are offering a $10,000 prize for one particularly interesting experiment in the High Altitude Astrobiology Challenge. We will also have a $5,000 reserve prize for the best experiment which does not win the High Altitude Astrobiology Challenge. We are seeking payloads that demonstrate the best practices of citizen science. Payloads must be genuine experiments that advance some field of science or engineering. We aren’t interested in textbook “experiments” which are merely demonstrations of well-known principles. Payloads intended to confirm the results of previous experiments are acceptable, if there is a legitimate need for confirmation. If you already know what answer you will get, it’s not an experiment. We aren’t “religious” about open source, however. You can use proprietary or closed-source components in your design, as long as those components are readily available. No one-of-a-kind parts or unobtainium. Our definition of open-source hardware simply means you must provide enough documentation for others to reproduce the hardware and permission to do so. Payloads must be buildable on a citizen-science budget using facilities that are reasonably available to citizen scientists. That means a TechShop, hackerspace, or DIY Bio lab, not Area 51 or Los Alamos National Laboratory. Our definition of “citizen science” budget is fairly open at the moment, but we do not consider James Cameron to be a typical citizen scientist. If you’re interested in flying an experiment with us, we recommend that you submit a notice of intent to notice of intent to experiments@rocketacademy.org as soon as possible. For our payloads, we will be using the CubeSat form factor. CubeSat is an international standard for small payloads. A standard CubeSat unit is a cube 10 centimeters on each side and no more than 1 kilogram in mass. The CubeSat specification also defines things like electrical specifications, but we won’t be following those parts of the spec which were developed for satellites and not necessarily relevant to us. CubeSat units can be combined for larger payloads. In addition to the standard 1U CubeSat, there are 2U CubeSats (10 cm x 10 cm x 20 cm) and 3U CubeSats (10 cm x 10 cm x 30 cm). Less common form factors are 4U (10 cm x 20 cm x 20 cm) and 6U (10 cm x 20 cm x 30 cm). There are also 0.5U (10 cm x 10 cm x 5 cm) and 1.5U (10 cm x 10 cm x 1.5 cm) form factors. We expect that most of our experiments will conform to a 1U or 2U form factor. The Lynx suborbital spacecraft does not strictly require payloads to conform to the CubeSat form factor, but using a standard form factor will make it easier for us to integrate your experiment with other payloads. It also makes it more likely that your experiment will be able to fly on other suborbital vehicles (such as those being developed by Armadillo Aerospace, Blue Origin, Masten Space Systems, and Virgin Galactic) in the future or on other science platforms such as aircraft, high-altitude balloons, satellites, or the International Space Station. One common design for nanosatellites, for example, is a 2U CubeSat with 1U allocated to the science payload and 1U for housekeeping. So, if you design your payload to conform to the 1U form factor, you might be able to fly it on a satellite in the future. We strongly prefer payloads that conform to the 1U form factor, if possible, so that we fly more payloads. 2U payloads are acceptable. For anything larger than that, you should check with us first. 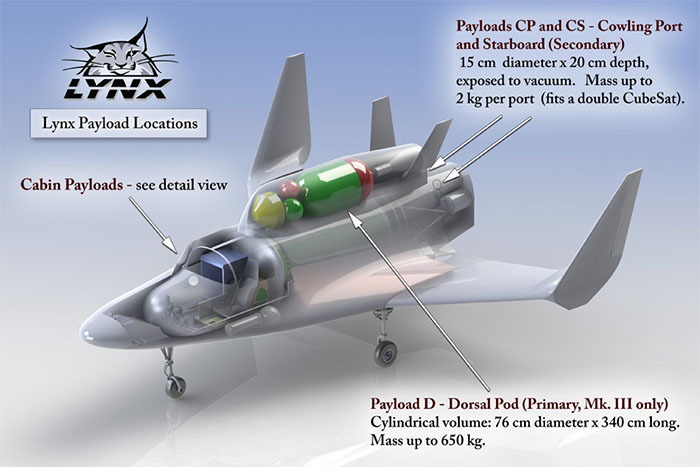 For our initial suborbital flight campaign, payloads will fly on the XCOR Lynx. We expect to fly payloads on other suborbital vehicles in the future. 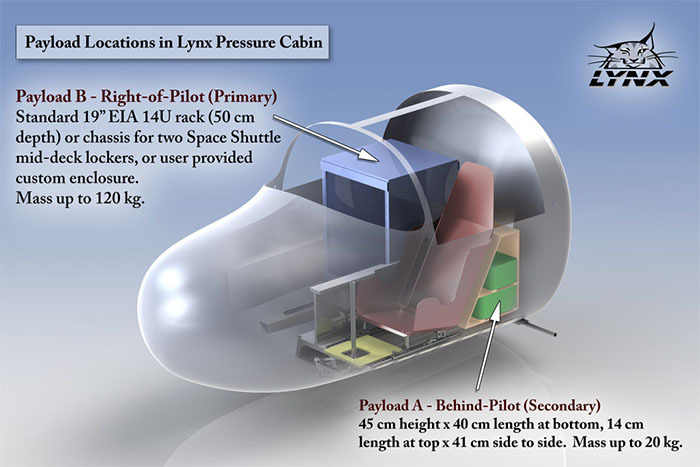 Lynx provides two basic payload accommodations. The first is an in-cockpit payload box, Payload A in the following illustration. (Payload B will not be available on our flights.) More specific information can be found in the Lynx Payload User’s Guide. The in-cockpit payload box will accommodate up to 32 CubeSat units by volume or 20 CubeSat units by weight. Because we will be flying a combination of 1U and 2U payloads, we estimate that we will be able to accommodate about 12 experiments on a typical flight. Each cowling port is a cylinder 15 cm in diameter and 20 cm long. Although the port can accommodate a cylindrical payload slightly larger than a 2U CubeSat, we recommend, once again, that payloads be limited to the 2U CubeSat form factor to maximize capability with future vehicles. Each cowling port has a hatch which can be opened at a predetermined point in flight to expose the payload to the upper atmosphere or space environment. Payloads can be optionally ejected using a spring mechanism that is provided by the Lynx. Ejected payloads must provide their own parachute or other recover mechanism. To determine points during flight when you might want to expose/eject a payload, consult the flight-profile charts in the Lynx Payload User’s Guide. Cowling ports are not airtight, even with the hatch closed. Payloads will be exposed to ambient temperature and pressure throughout the flight and on the runway prior to takeoff. Mojave Air and Space Port can be hot or cold, depending on the season, weather, and time of day. Because the payload will be exposed to vacuum, it cannot rely on air cooling for temperature control of electronics, for example. Payloads, whether carried in the payload box or the aft cowling port, can draw power from their own self-contained batteries or from a payload-power bus provided by the Lynx. Payloads that supply their own power will be easier to integrate and easier to adapt to other vehicles and platforms in the future. Payload on/off signals are also available. Consult the Lynx Payload User’s Guide for more information on signals and connections. From time to time, we will be publishing experiment ideas on our blog. To view the some of our current experiment ideas, click here. When you start developing a payload, you should let us know what you’re doing so we can plan for it. an online registration form for payload developers will be available in the near future. I have multiple ideas and I’m going to share this with several professional scientists who are members of our non-profit organization. 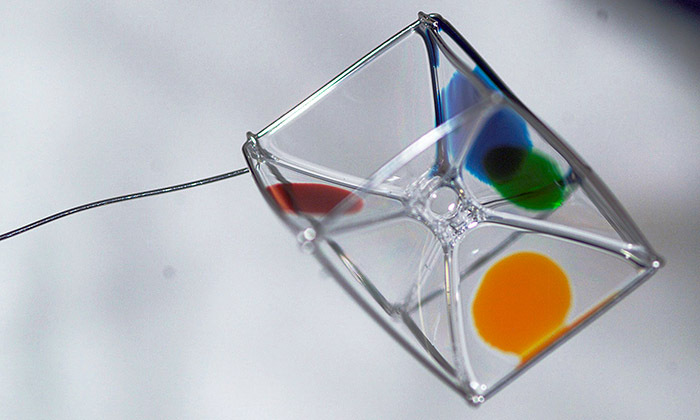 There are several who have current experiments in the works from protein crystallization techniques to astrobiology ones. Payloads carried in the Aft Cowling Port are optionally ejectable. Consult the Lynx Payload User’s Guide for details. Is this challenge still open? I would love to participate and have quite a few ideas I would like to see happen in zero-gravity space. What do I need to do in order to register?? Thanks! Just go to our “Contact” page and use the link to submit a Notice of Intent. You will see many more details appeared over the next few months. Does the notice of intent have to include what my experiment is, or only that I intend on submitting an application for my experiment when the time comes? Include as much information as you can so we know what’s coming. That will enable us to provide feedback if it’s warranted. For example, if a number of people are working on duplicative experiments, we can inform them of that fact so they can collaborate or possibly decide to work on something else. Sounds great, thanks for your answers. The fact that an admin for my favorite site is answering me has me all giddy. I’ll send the intent this weekend, with a description of the experiment. Thanks so much. This is huge!